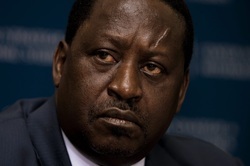 In a statement, Mr Odinga said he was not consulted by President Kibaki as required by law before Ms Masoud and five other NPSC members were picked by the Head of State. “This is to inform the general public that the nominations Announced today by the office of the president for the chair and members of the national Police Service Commission have been made without consultations with the Prime Minister,” said the PM in a statement signed by an aide Caroli Omondi Thursday. Mr Odinga is in Brussels, Belgium on official duty. On Thursday, President Kibaki nominated Ms Masoud as chairman of the commission that shall vet, hire, fire, discipline and transfer police officers. He also named Esther Chui- Colombini, Ronald L Musengi, James A Atema, Dr Major Muiu Shadrack Mutia and Ms Mary Auma Owuor as members. But in a rejoinder, Mr Odinga termed the nominations "unconstitutional and therefore null and void as such". "Such consultation is mandatory under the Constitution, the National Accord and the National Police Service Commission Act. There have been no such consultations between the two principals. The nominations are unconstitutional and therefore null and void as such," said the PM. Under the law, Parliament is required to consider the names within 21 days and approve or reject them. The House will request for new nominees in the event of the latter. Speaker Kenneth Marende directed Thursday that the names be forwarded to the parliamentary committee on Administration and National Security for consideration together with accompanying CVs. Ms Masoud was among a list of three names that was forwarded to President Kibaki and Mr Odinga by the panel that was mandated to set up the team that will spearhead police reforms in the country. The others were Johnstone Kavuludi, a former civil servant, and Murshid Mohamed. Britain was on Thursday accused in Parliament of seeking to have President Kibaki indicted over the 2007/8 post-election violence. MP Charles Kilonzo also accused the United Kingdom of propping up Prime Minister Raila Odinga and pushing for the detention of Deputy Prime Minister Uhuru Kenyatta and Eldoret North MP William Ruto at the International Criminal Court. A spokesman for the British High Commission, Mr John Bradshaw, described the allegations as preposterous. “We don’t even bother to comment on it. We have strong respect for Kenya and our good relationship with the Kenya Government will continue,” he said. “We do not recognise the document discussed in the Kenyan parliament today (Thursday),” he added. MPs demanded an immediate severing of relations with Kenya’s former colonial ruler. They accused Britain of gross interference in Kenya’s affairs. Mr Kilonzo said the document indicated that the British Government preferred Mr Odinga to be the next president so that he could facilitate the handing over of President Kibaki to the ICC. The document also indicated that the UK wants Mr Kenyatta and Mr Ruto arrested for allegedly threatening the security of the country through their so-called “prayer rallies” . Ikolomani MP Boni Khalwale, citing Article 35 on the right to information, said the document had also cast “aspersions” on the House Speaker, saying he had indicated to the British High Commissioner the possibility of a December election in case the two suspects were detained at the Hague. President Kibaki led thousand of Kenyans in paying tribute to the former Kiambaa MP saying he worked hard to unite the country.Mr Karume died Friday last week after a battle with cancer. He passed on when undergoing treatment at the Karen Hospital. President Kibaki said all Kenyans should emulate Mr Karume's example and shun tribalism in their day-to-day activities. Prime Minister Odinga echoed the President's sentiments saying the late Karume championed inclusivity of all communities in national affairs. Others who spoke included former president Moi, Vice President Kalonzo Musyoka, Deputy Prime Ministers Uhuru Kenyatta and Musalia Mudavadi, House Speaker Kenneth Marende and Transport minister Amos Kimunya. Others were Court of Appeal judge Kihara Kariuki and businessman Duncan Ndegwa. Mr Karume's family sources said his health deteriorated last December and he was treated in India and later admitted briefly to the Aga Khan University Hospital. NAIROBI, Kenya — East African heads of state, including South Sudan president Salva Kiir, attended a ceremony Friday to mark the beginning of construction for a controversial new port in Kenya’s eastern coastal region of Lamu. Villagers fear the port may ruin idyllic beaches that draw Hollywood stars to the nearby island of Lamu year after year. But Kenya hopes the port will make the country a regional telecommunications and transportation hub. Kiir said the port will be a terminal for an alternative oil pipeline through Kenya, freeing South Sudan from its dependence on the infrastructure of Sudan, its former ruler in the north. South Sudan seceded from Sudan in July. Landlocked South Sudan stopped pumping oil through Sudan in January, accusing the government in Sudan’s capital Khartoum of stealing hundred millions of dollars of oil revenue. Sudan responded Wednesday by bombing two oil wells in the south, Kiir said. Kiir thanked Kenya for signing a memorandum of understanding to allow the new country to construct an oil pipeline from South Sudan’s capital of Juba to the port. He said the port is strategically and economically important for the region. Construction will be done in phases and will cost Kenya about $24.5 billion, according to Kenyan government estimates. The port is part of a wider project to improve infrastructure in the region. It is designed to include a highway, a railway line and a petroleum pipeline crossing over three countries. Kiir said the improved transport links and pipeline could create a backbone for South Sudan’s infrastructure and allow his country to end its reliance on oil. “The port of Lamu project will create economic opportunities and employment. It will make goods and services more abundant and affordable in our markets,” Kiir said. South Sudan’s current lack of infrastructure means the cost of goods, such as sugar and maize, is higher there than in any other countries in the region. A lobby group called Save Lamu has objected to the construction, saying not enough has been done to study the impact of the port on the environment and the nearby island of Lamu, listed by UNESCO as a World Heritage Site. The group said in a statement Thursday that the communities in Lamu have not been consulted and land ownership was not being respected by the government. “We are greatly concerned that the lack of transparency, secrecy and poor accountability in the way the project being implemented,” said Abubakar Al-Amudy, the chairman of Save Lamu. Al-Amudy warned that the project may collapse if the lack of accountability persists. Kenyan president Mwai Kibaki said the government is aware of the concerns raised by the people of Lamu, especially with regard to land, environment, cultural heritage and fishing grounds. “The rights of the people of Lamu, like the rights of all other Kenyans, are enshrined in the Constitution and are, therefore, inalienable. I have instructed the relevant government ministries and agencies to move with speed and ensure that these concerns are addressed as soon as possible,” Kibaki said. Ethiopian Prime Minister Meles Zenawi also attended the launch. Nairobi - Kenyan police are hunting for a British woman who has been using the identity of the widow of one of the suicide bombers who attacked London's transport system, an official said on Thursday.Police suspect that she is fund raising for a terrorist group, said the official who spoke on condition of anonymity because he was not authorised to release the information. The suspect has been using a number of identities, including those of Samantha Lewthwaite and Natalie Faye Webb, the official said. Somalia, after a conference in London. seven-point plan vowing more aid, and help fighting terrorism and piracy. The UK's David Cameron, hosting the meeting, said it was vital to build astable and prosperous Somalia. Two decades of civil war has wrecked the country. Al-Shabab militants, who recently joined with al-Qaeda, control large swathes of territory. The country has been without a functioning central government since 1991. The current transitional government has direct control only in the capital Mogadishu. future, and must work alongside military action taken by the African Union (AU).